Let The Right One In is yet another vampire novel turned film. The Swedish romantic horror film was directed by Tomas Alfredson and is based on the novel of the same name by John Ajvide Lindqvist, who also wrote the screenplay for the film. 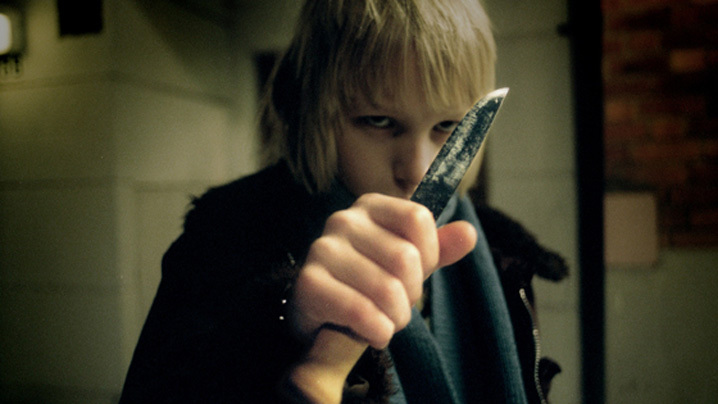 Let The Right One In is about a 12 year old boy named Oskar who is frequently bullied by his classmates. He dreams of getting revenge but never stands up to the others, instead takes his frustration out on a tree which catches the attention of his new neighbor. Everything changes when Oskar meets the pretty Eli. Eli is a bigger outcast than Oskar and the two form a friendship and much more. The twist is that Eli is no ordinary girl, she is paler even than Oskar, she only comes out at night and she feeds on blood, making her, of course, a vampire and revealing that she has been 12 for a very long time. The two form a bond and Eli gives Oskar the love and revenge he dreamed of. Eli shows him how to defend himself and how to stand up for himself. Initially Oskar doesnât mind that Eli is a blood thirsty monster, especially when she goes on to destroy his enemies for him but as the bodies pile up Oskar is at a loss for what to do for he doesnât want to give up his only friend and love. Yet at the same time the film leaves you wondering who the real monster is. Eli or what Oskar has become. Director Tomas Alfredson creates a dark and disturbing film but one of great depth. Even though the movie is full of blood and gore and disconcerting horrors, Alfredson still manages to make the relationship between Eli and Oskar seem innocent and sweet amidst it all.Â Let The Right One In may be about two children, but it is most definitely a movie for adults only. I LOVED this movie when I saw it. Beautifully done. This was a great vampire movie.